Welcome back dear readers! 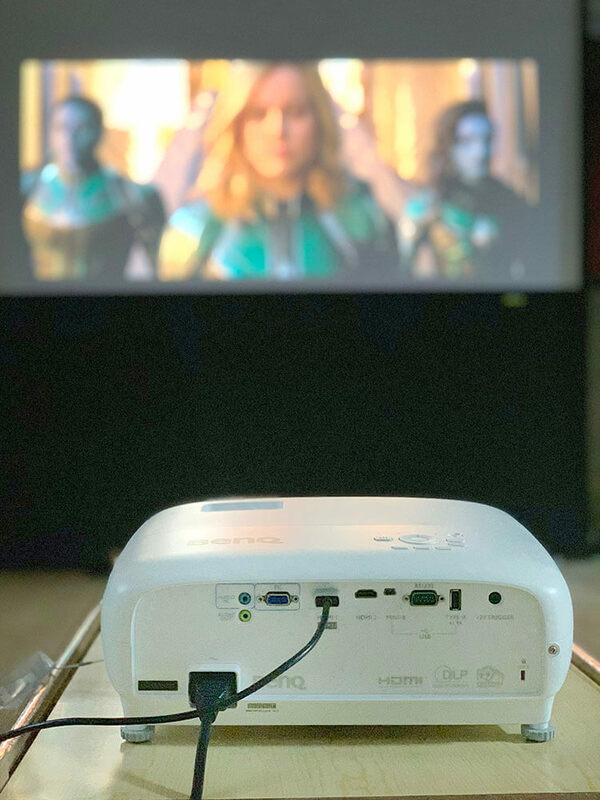 By now you would have read my previous post about 4 Easy Steps to Set Up the BenQ TK800 Home Projector in a small living space. 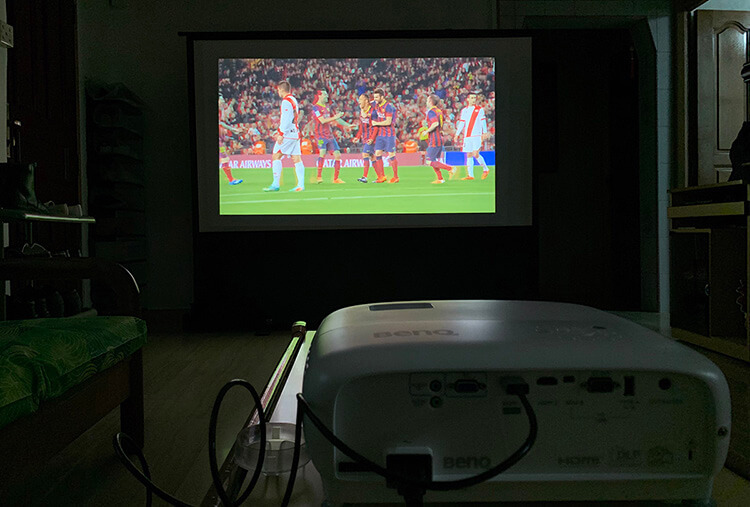 In today’s article, I am going to share with you my visual experience with BenQ TK800 Home Projector – colour reproduction. What are the expectations when you are watching your favourite sport under ambient lighting? In many cases we tend to realise some part of the screen has a darker contrast, especially when we are surrounded by a brighter or darker background. It may provide an uncomfortable viewing experience. However, with the HDR mode in TK800, it can project a brighter and more detailed texture. It also provides users a magnificently vivid and 4K big screen entertainment experience whether in a well-lit room or darker environments. Here is a useful guide for sports fans. 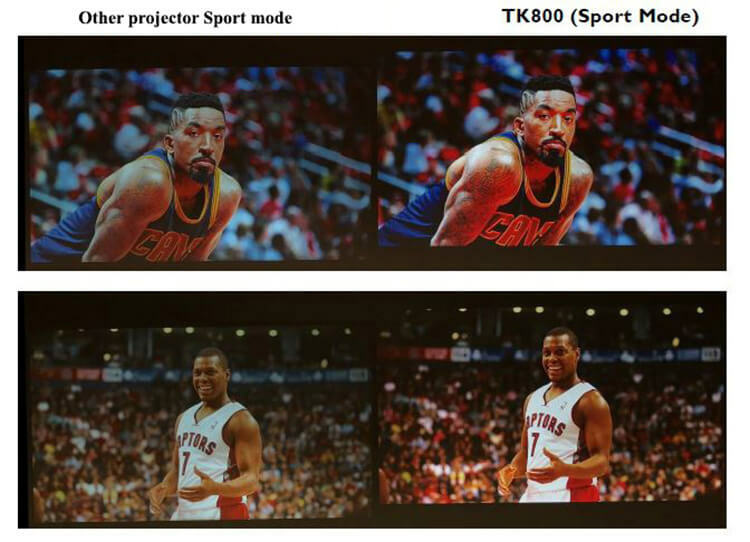 Introducing the Sport Mode in TK800 which is designed for indoor sports games (e.g. basketball). Sport mode can render realistic skin tones and highlight the warm wooden floor and bright coloured jersey. The sound is also enhanced by the 5-watt chamber speaker and CinemaMaster Audio+ 2 technology. And Sports Sound Mode accentuates the announcer’s commentary and clear acoustic details of squeaking sneakers, referee whistles, and skates scraping in an indoor arena. Watching your favourite drama from BenQ TK800 projector? Not a problem! Make a switch to Vivid TV Mode! It contains new RGBW colour wheel with nanometer-level coating displaying more vivid colours and draw more attention to the characters to create a more lively human experience. With Vivid mode, you can definitely enjoy your exciting drama on a bigger screen under the ambient environment. BenQ TK800 home projector delivers a constant sharpness and distinct 4K colour quality under ambient lighting. The cutting-edge 0.47″ DMD Chip makes every detail of the image displayed on the screen breathtakingly sharp. 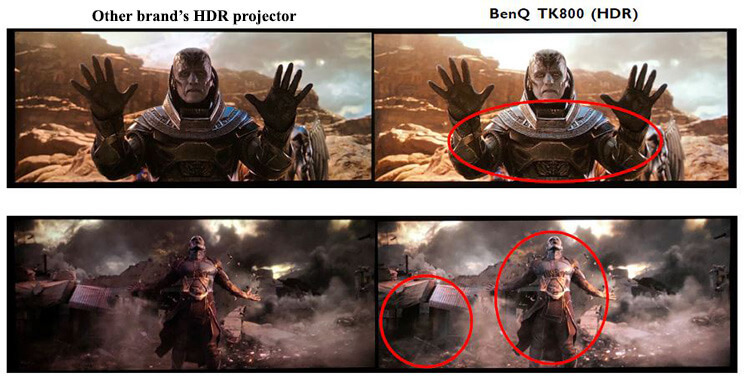 I am amazed that BenQ TK800 projector is using the new 4K colour wheel to achieve 92% Rec. 709 colour space without dramatic brightness decrease. As a result, I am able to enjoy a vivid colours in a room with ambient lighting. The projector-optimised HDR, auto colour and tone mapping of TK800 contribute to greater brightness and colour contrast. BenQ CinemaMaster Audio+ 2 audio-enhancing technology combines exclusive EQ algorithms with exotic materials such as magnesium and rubidium alloys to produce pure clarity, exquisite vocals, delicate details, and sensual sound quality as used by Hollywood studios without distortion. Lastly, I would say that the BenQ TK800 home entertainment projector gives precise details in every part of the screen to create perfection. In conclusion, the BenQ TK800 home entertainment projector gives precise details in every part of the screen to create the best visual experience. I definitely recommend it! Well, it’s time to immerse your family in Big-Screen Entertainment with BenQ TK800. Cheers! Wahhh… u got this at home ah? Syok eh!